Fertile eggs in commercial "hatcheries" will generally hatch 50% female and 50% male. In order to have and maintain the size of a flock numbering 7.4 billion females, 7.4 billion males will have hatched alongside their sisters only to be regarded as waste in an environment that does not see chickens as sentient individuals but as commercial assets and the means to create eggs and thus wealth for our species. I estimate that 7.4 billion (7,400,000.000) male chicks are annually subjected to death (the industry euphemism is ‘culled’) within hours of hatching. Think about it. 7.4 BILLION deaths. And that’s before a single egg is used. I find my thoughts returning frequently to chickens; these wonderful, gentle, friendly little birds whose species bears the brunt (in terms of sheer numbers) of our own species’ arrogant delusions of entitlement and staggering ignorance about necessity. I’ve written many times about these bright, complex and fascinating birds. So why do I keep writing more? Because there are just so many reasons why we all need to stop using them; because they so richly deserve to be recognised and championed; because there’s simply too much to say in one piece. And because I live in hope that I can find new words to reach the hearts of those who have not previously acknowledged the horrors of what we are doing as a species. 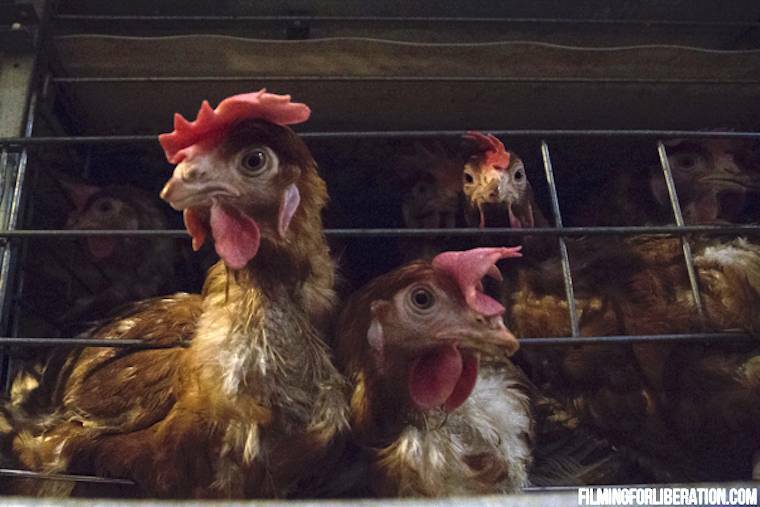 My most recent article about chickens drew an analogy between puppy mills and hens. Several readers pointed out that this article concentrated on the selective breeding that has been perpetrated upon these defenceless creatures and did not address other aspects. That’s true and it was deliberate. I did it because selective breeding is often the very last reason that advocates may mention when asked the question about why using hens for eggs is unethical. Here, I’d like to fill in another piece of information; and other reason why we simply need to stop the madness. I’ve been blogging and using social media for several years now, and over these years there’s been a particular trend that I couldn’t help but notice. My posts on social media about chickens, and particularly those about eggs and the individuals who lay them, tend to attract less outrage, and more defensive and contradictory reactions than posts about almost any other animal rights topic or species. There is less support and there are fewer ‘shares’. Even this post is likely to go up like the proverbial lead balloon. Is it because few people are prepared to recognise that there’s even a problem with our exploitative behaviour? Is it because people feel insufficiently informed to defend a stance against egg use? I’ve often wondered about this, dredging up recollections from the days before I became vegan in an attempt to understand why. In almost all other species, many readers can empathise with, understand, and decide to reject the violence inherent in all our use of other animals; violence that is epitomised by our brutal exploitation of female reproduction. However as soon as someone mentions eggs, everything changes. Suddenly it becomes all about the type of environment in which they are used, the way they are treated while being used; there are calls for stricter enforcement of regulations to govern how they are used, there are some who advocate ‘backyard’ environments in which to use them, there are anecdotes and claims about personal ‘exceptions‘ to the inherent brutality of our use, all seeking to disprove the need for moral rejection of the unnecessary exploitation of a fellow sentient species. On behalf of those billions of defenceless victims whose primary value to our species lies not in who they are as individuals, but rather in the number of eggs that their fragile and selectively bred bodies can produce before they self-destruct, it is distressing to witness their continued torment being promoted, championed and excused on all sides. So what do we all need to know? In these essays I hope to cover everything I have learned about chickens and why we all need to stop using them. I hope to provide statistics about their use for their flesh, their use for eggs, and the continuing selective breeding that seeks to further maximise human profits at the expense of defenceless victims. Hens, roosters and chickens need us all so desperately and so it is vital for everyone who advocates on behalf of animals to understand that even were they to be accommodated in a perfect environment and afforded the best of treatment, this can never address the fundamental issues at the heart of an insidious industry that responds to consumer demand for an unnecessary dietary indulgence, while keeping the truth about the horrific practices that are the inevitable consequence. So what about male chicks….? I’ve no idea where the notion came from but I did once imagine that as only the females could lay eggs, it seemed logical that the males would be used for their flesh. Well, guess what? The truth, as I learned once I finally shook off the decades of brainwashing, was unthinkable. Contrary to what many suppose, chickens who lay eggs and those who are used for their dead flesh are separate breeds; breeds that have each been ‘adapted’, selectively bred and genetically modified to maximise the profit-making potential of whatever use is being made of their bodies. 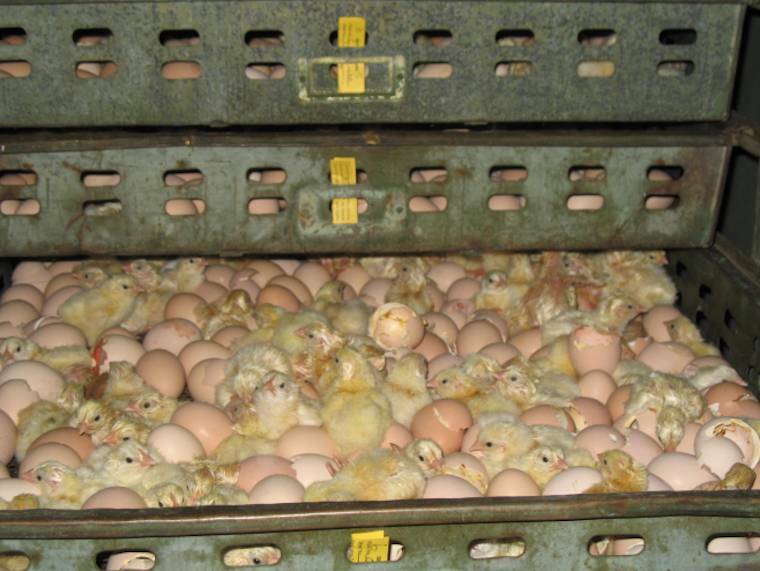 The males of egg laying breeds are killed shortly after hatching; suffocated or macerated with the resultant bloody sludge used as pet food or fertiliser. ‘Instantaneous mechanical destruction’ (maceration) is listed as an approved method of ‘culling’ chicks, poultry and ducklings by the staggeringly inappropriately titled RSPCA (prevention of cruelty, anyone?) as part of their ‘*welfare standards’. Let’s bear in mind that these are guidelines for the treatment of lifelong captives on death row that refer to ‘five freedoms’ without even a trace of irony or shame. Which brings me to another memory. At one time I fancifully imagined that ‘welfare’ meant something to do with well-being. Although we are encouraged to think it does, the industry word ‘welfare’ has absolutely nothing to do with the life, the thoughts, the feelings or the well-being of our unnecessary victims as unique individuals . The word ‘welfare’ refers to a collection of guidelines and recommendations developed by the exploitation industries and their collaborators to standardise practices, minimise risk to assets and employees, and maximise profit. Statistics about the size of the global flock of egg laying hens are ridiculously hard to come by. There are endless statistics available about eggs; glossy marketing blurb that analyses and details tonnage per country, global market shares, market trends and other information couched in the most impersonal terms of resources and commodities. However hardly anywhere is it possible to find statistics about how many tiny feathered slaves are labouring despairingly in hell to produce this ‘commodity’. A US industry site quoted a 2014 global flock of 7.2 billion individuals (7,200,000,000). In the US, after a small dip in 2015, the number of individuals rose by approximately 3.4% in 2017, and this dip and percentage increase is similarly reflected in the UK. In view of this, it is not unreasonable to extrapolate that the global flock is likely to have reflected this trend and currently stands at approximately 7.4 billion individuals (7,400,000.000). This number is clearly significant for a number of reasons, however I have been keen to establish it on this occasion in connection with one of the least publicised victim groups within an industry predicated upon wall-to-wall atrocities. Fertile eggs will generally hatch 50% female and 50% male. In order to have and maintain the size of a flock numbering 7.4 billion females, 7.4 billion males will have hatched alongside their sisters only to be regarded as waste in an environment that does not see chickens as sentient individuals but as commercial assets and the means to create wealth for our species. It is possible to attempt to ‘screen out’ males before hatching and although there have been undertakings to introduce this by 2020 in the USA, industry sources report that this target is unlikely to be met and in any case, it is not globally relevant. Here we have yet another example of some-day-never ‘commitments’ for the distant future, a commonly used ploy to maintain consumer confidence. If the options available for those deaths were presented to you or to me for our own demise, that of a loved one or one of our companions, I think we’d soon realise just how monstrous the lie of ‘humane’ ‘culling’ truly is.